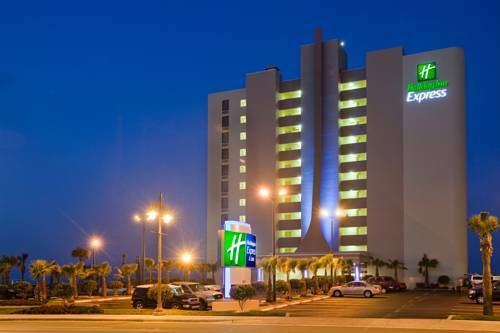 Welcome to the new Award Winning Holiday Inn Express & Suites Oceanfront hotel located in Daytona Beach Shores, FL. We offer the finest amenities including private balconies with direct views of the pristine Atlantic ocean and the Worlds Most Famous Beach , complimentary high-speed wireless Internet, microwaves, refrigerators, and HD television on our 32 flat panel TVs. You can bask in the sun or relax and enjoy the sunrise. Start your day off enjoying our free full hot breakfast buffet or by exercising in our fitness room with an amazing ocean view. You will also want to make time for golf at one of our many championship courses, enjoy the roar of the engines as NASCAR and Daytona International Speedway gear up for the many events. We are just minutes away from Main Street & the Cabbage Patch, both are popular destinations for our world famous Bike Week and Biketoberfest. Our Daytona Beach Shores hotel is just minutes north of the Ponce de Leon Inlet Lighthouse. Enjoy the best seafood Florida has to offer, while watching dolphins swim nearby at the Deck Down Under and Aunt Catfishs, all within walking distance of the hotel. For day-trippers, we are just a short drive to Walt Disney World and the Kennedy Space Center. From our courteous and helpful staff, to our fresh, newly renovated guest rooms, you won't find a better combination of quality and service at the beach! Full bar with pool tables for billiards. Smoking is permitted. Full liquor bar with pool tables and Karaoke. Smoking is permitted. German brew pub atmosphere, offers over 150 brands of beer. Also serves sandwiches. Non-smoking. The Ocean Room seating can be arranged in Boardroom style, Classroom style, Hollow Square style, or Theater style as needed. Oceans Golf Course is a Public, Par 3, 9 Hole golf course just North of our hotel. Home of the Daytona 500 . Race fans can enjoy races and tours of this world famous track. New Smyrna Speedway is an asphalt track that is 0.48 of a mile in length, located near New Smyrna Beach, Florida, that races Florida Association of Stock Car Automobile Racing stock cars every Saturday night. Premier Tennis Center for the USTA in Florida. The USTA and Greater Volusia Tennis League hold matches at this center. Open to the public when not used for matches. Features 24 clay courts. Call for times and fees. ~5 miles from Daytona Beach Shores. ~45 miles from Daytona Beach Shores. ~54 miles from Daytona Beach Shores. ~56 miles from Daytona Beach Shores.